Cisco’s security research group, Talos, just announced a free open-source tool that can be used to dump configuration parameters used by the known variants of Locky e.g. .locky, .zepto & .odin based ransomware. This can be helpful for tracking and researching the particular variant you are dealing with meaning figuring things out such as what attack method is used to deliver that particular variant. The original post can be found HERE. Locky has continued to evolve since its inception in February 2016. This has made it difficult to track at times due to changes in the way in which it’s distributed as well as various characteristics of the malware itself. The actors responsible for Locky have continuously attempted to improve operational security (OPSEC) in regards to the tracking of affiliates making use of the ransomware. This post will discuss a new Locky configuration extractor that Talos is releasing, which we are naming ‘LockyDump’. This is the first open source tool which can dump the configuration parameters used by all currently known variants of Locky e.g. .locky, .zepto & .odin based ransomware. Using LockyDump you can run a known Locky sample within a virtualized environment and it will extract and provide all of the configuration information for the sample, including the AffilID associated with the sample. The latest variant of Locky made this extraction process increasingly difficult. Once this config extraction changed Talos looked to reverse further Locky samples in an attempt to gain the all important AffilID information. Obtaining the affiliate information for individual samples allows the historical tracking of Locky affiliates to identify trends and other characteristics on an individual affiliate basis such as their primary distribution method of choice e.g. through the use of Exploit Kits (EKs) or spam/phishing email. Talos has created a configuration extraction tool that supports Locky (all current versions ie; Zepto/Odin) and allows you to extract the following configuration parameters that have been hardcoded into the malicious binary. Locky has been distributed as both Win32 executables and DLLs and as such, we created LockyDump to utilize two separate analysis methods. DLL files are started with LoadLibrary, which enables the unpacker to expose the Locky code and lets the initialization code decrypt the configuration. Once the decrypted configuration is exposed LockyDump locates it and prints to stdout. The versions of Locky delivered as EXE files required a different approach to analysis, which is accomplished by executing the malware with LockyDump configured to debug it. The malware is allowed to run until the true code is detected, at which point LockyDump freezes its execution. LockyDump then locates the configuration information and prints it to stdout. Verbose Output – Locky configurations include two templates: one for the ransom note image and one for the ransom note HTML. By default LockyDump does not print these two fields because they increase the size of the output significantly. If the environment variable LOCKY_DUMP_VERBOSE is present then both ransom note templates will be printed to stdout. 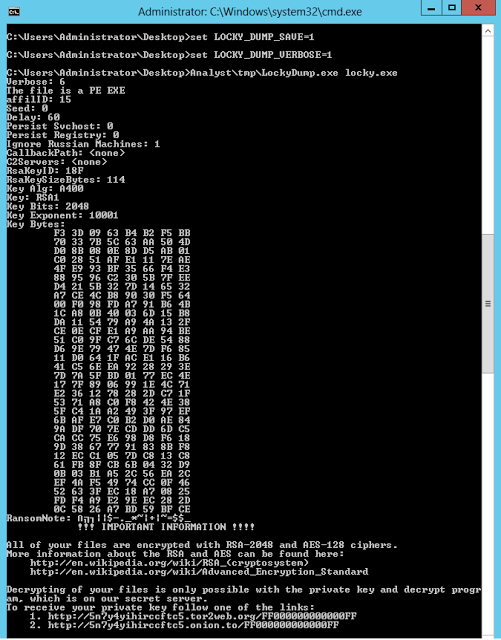 With LockyDump a user can take a virtualized instance of Microsoft Windows, place a known Locky sample within it, and run LockyDump against it. The use of a virtualized environment is highly recommended as LockyDump will execute Locky to allow the extraction of the configuration information from memory. The LockyDump source is available from our GitHub. We have provided both the source and a compiled binary for usage. Talos is releasing this to the open source community to allow other researchers to perform their own historical analysis of Locky. The Virus Bulletin talk from Fortinet provided enough information to warrant this release for others as it was not apparent whether the Fortinet configuration extraction tool would be made public. The release of this tool coincides with a large downturn in spam-based Locky distribution that we have observed over the last week. With this in mind be aware that the ever evolving Locky could come back sooner or later with a different method of configuration inclusion which would potentially prevent this tool from working. In that instance we will aim to release an updated version that can continue to operate correctly and as intended.